This animation allows you to control the visibility of an object. There are three inputs required for this animation: Tag, Min, and Max. When the value is within the min and max values range, the object will be visible; otherwise, it will be hidden. To animate visibility based on the discrete (Boolean) value, set both Min and Max to 1; this way the object will become visible when the tag value equals 1 (TRUE). 2. 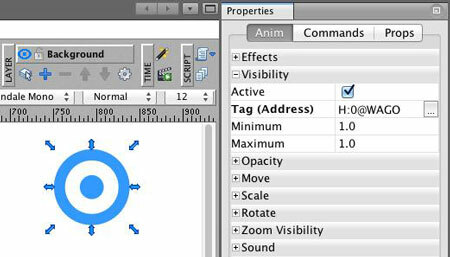 Set the Tag (Address) and the Minimum and Maximum; if the tag value is within this range, the object will be visible, otherwise, it will be hidden.